SEOUL • South Korea coach Shin Tae Yong promised a strong showing at next year's World Cup Finals, even as fans expressed fears for their prospects after they struggled to qualify for the tournament. 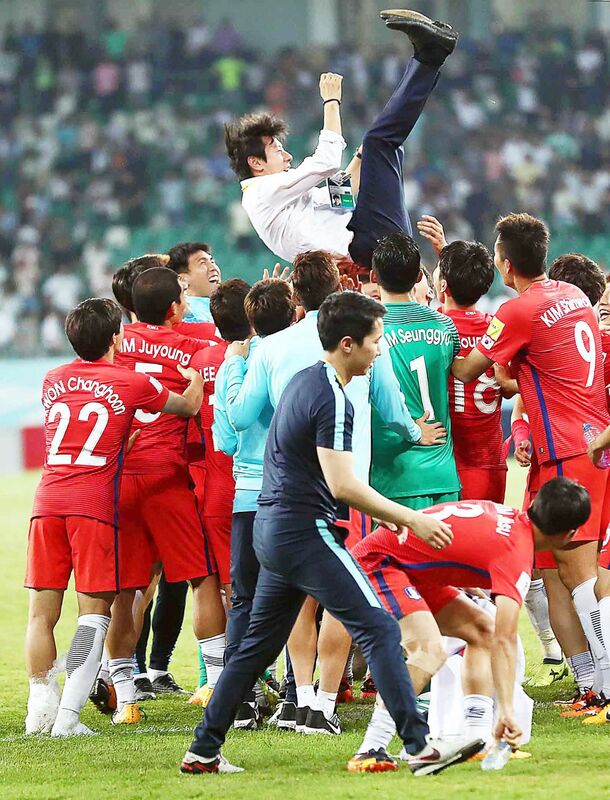 With two goal-less draws to round off qualifying, South Korea's ninth straight qualification for the World Cup Finals was more of a stumble over the line than a confident march to Russia but it was enough for a relieved Shin to claim mission accomplished. Under fire after being held 0-0 by 10-man Iran at home last week, they responded with another stalemate away to Uzbekistan on Tuesday. They had to rely on already-qualified Iran to stave off a desperate Syria in their 2-2 draw in Teheran and be assured of nabbing the second automatic berth to Russia in Group A of Asian qualifying. The performances may do little to win over sceptics, but Shin said fans have yet to see the real South Korea. "We will prepare for the World Cup thoroughly," he said in comments published by Yonhap news agency yesterday. "I'm a man who likes to play an attacking football. The world will see how strong South Korea are at the World Cup." A former assistant to Uli Stielike, Shin replaced the German for the final two matches of qualifying after Stielike was sacked in June following a disappointing run of results. He was hardly given a vote of confidence, with the Korea Football Association (KFA) offering a contract that would see him terminated if they failed to advance to Russia. Little wonder he showed a pragmatic side in maintaining a defensive set-up against Iran, even with a one-man advantage. Prior to the match, South Korea leaked 10 goals in eight matches, the joint highest in the group. South Korea finished the final phase of qualifying with 11 goals, also the highest in the group, but the scoring has fizzled out this year, with the team held goal-less in five of their past eight matches. Fans had mixed emotions after a difficult qualifying campaign that included shock defeats by China and Qatar. "I am confused. Why am I angry rather than joyful after the team reached the World Cup?" one fan wrote on the South Korean web portal Naver. Another called the performance against Uzbekistan lacklustre, adding that while watching they felt "as stuffy as if I had 100 sweet potatoes at one sitting without washing them down with water". "Should we go to the World Cup just to be knocked out in the first round?" the fan added. But local television stations and the KFA exhaled a collective sigh of relief. A South Korean defeat could have left the country's three major broadcasters facing major losses after they jointly paid US$95 million (S$128.45 million) for the rights to show Russia 2018. In Group B of Asian qualifying, Saudi Arabia claimed their World Cup place with a 1-0 win over Japan. Substitute Fahad Al Muwallad scored a spectacular winner for Bert van Marwijk's side, who qualified for the first time since 2006 with victory over a Japan team that had already reached the Finals. The result pushed Australia into third in Group B and a place in the play-offs, where they will meet Syria.